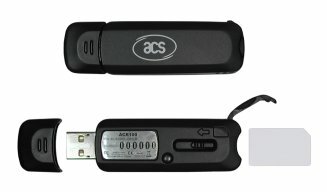 The ACR100 'SIMFlash' from ACS is a high speed USB 2.0 device incorporating both a SIM-sized smartcard reader and 2GB of on board flash memory that acts as a normal flash drive. This reader is fully PC/SC and EMV Level 1 compliant and supports all ISO 7816 microprocessor-based smartcards, GSM cards and numerous popular memory cards. The reader can be used in a wide variety of applications such as GSM, PKI, electronic payment and home banking. Since software can be installed onto the reader's built-in flash memory this device is an ideal carrier for portable applications. The ACR100 comes with WHQL approved drivers and the integrated sliding carrier makes for easy insertion and removal of a SIM-sized card. 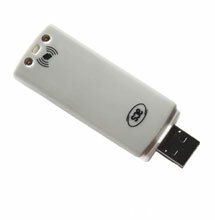 The reader also includes an in-built contactless MIFARE 1K chip that can be used for various applications. Development kit for the ACR100 SIM-sized reader - an in-depth development package allowing users to program applications compatible to the ACR100 SIM-sized smartcard reader and utilizing the device's on board memory.